Ken Troop is a designer and writer at Wizards of the Coast. He has written the short story "Five Brothers" for the Shadowmoor anthology and has written "Talrand, Sky Summoner" and "The Consequences of Attraction" for Uncharted Realms. 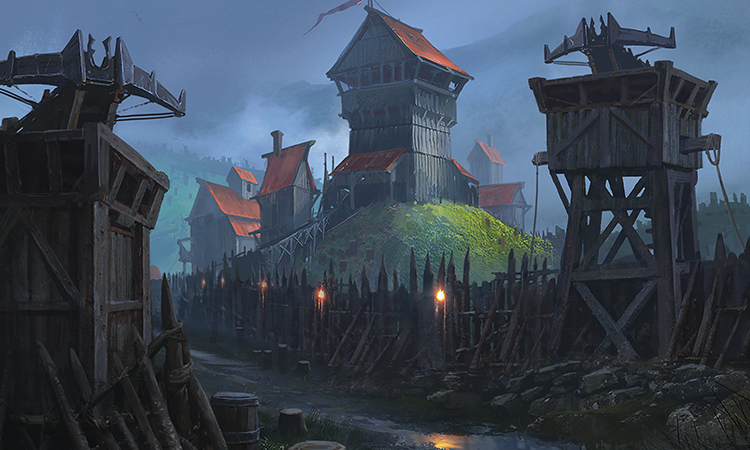 Innistrad has entered a new age of prosperity and peace. 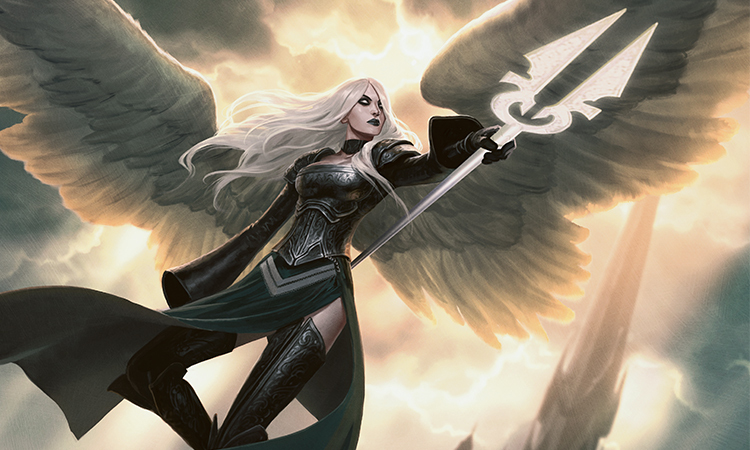 Avacyn, a powerful angel who is the living embodiment of hope and protection for humans everywhere, is free from her imprisonment and has helped the humans beat back the evil horrors that lurk within Innistrad. 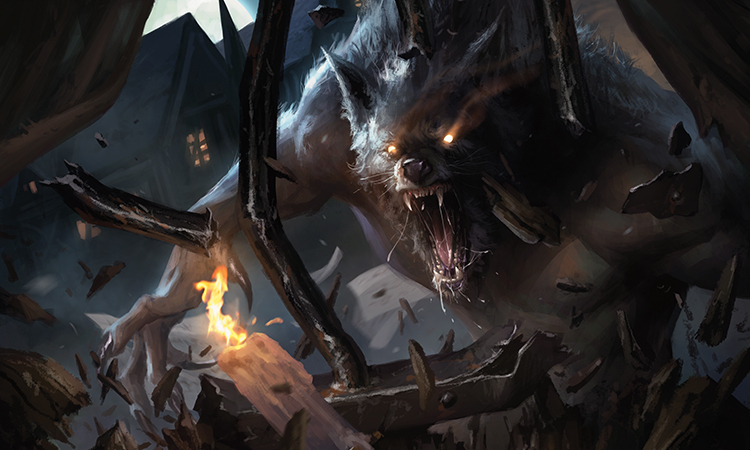 The vampires are in retreat, and the werewolf curse has been alleviated by the Cursemute, a magical edict from Avacyn that gave afflicted lycanthropes the choice either to become wolfir, wolven servants of Avacyn, or, in rarer cases, to be fully cured. She hovered in the thin cold air, air so thin her wings would have been insufficient to keep her aloft without the aid of power. It was one of her favorite retreats, a desolate valley in the highest mountain passes in southern Stensia. The cold was absolute at this height. Thick frost covered every surface, permitting no life to abide. Avacyn did not feel the cold. She appreciated the solitude, the purity of wide space with nothing for company but the crackling ice, the whistling wind, and the whispers of prayers. The prayers were always present, a constant insistence in the back of her mind. From the briefest moments after her awakening, the prayers were there. They were few at first. Small, tentative, searching. But over time the number of prayers grew, and they became more direct, more beseeching. Protect us, save us, help us. Help me! A panicked prayer broke through the normal murmurs. A woman's voice, a woman in pain. Avacyn hear me! My child! My child! Please! My Avacyn! Avacyn focused on the prayer, on the woman sending it to her, and saw an image of the woman running and sobbing in the middle of a large meadow. Avacyn soared above the mountaintops and swooped down to the south toward Gavony. Though she heard thousands of prayers throughout the world, she rarely had time to address them individually. From the beginning of Avacyn's existence had been the word PROTECT. Even now, thinking of it triggered the cascade of images that had accompanied her first moments of existence. A flash of a world draped in autumn and blood, and the numerous predators poised to ravage it. Vampire and werewolf. Demon and zombie. Geist and devil. 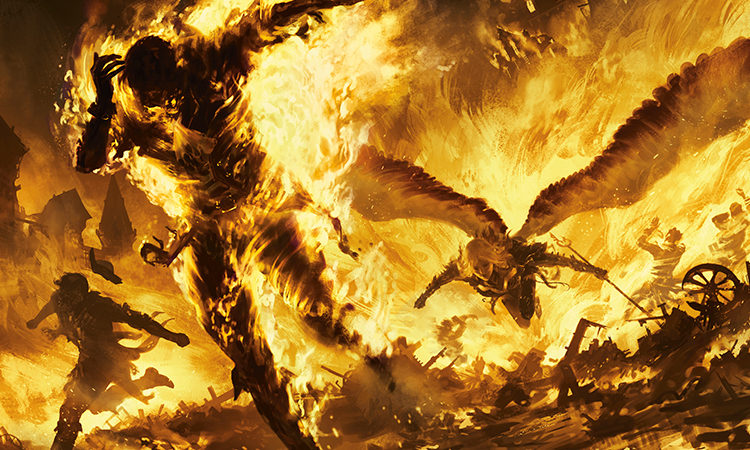 Each one seared into Avacyn's mind, into her very identity, as a threat to be fought and scoured. And the images of the mortals in all their shapes and sizes, their humanity defined by their frailty and their devotion. PROTECT. And over time, Avacyn's understanding of the word grew, became more nuanced. PROTECT THEM. This concept was Avacyn's essence. With each passing year, the purpose of her existence had unfolded in crystalline beauty. She was not meant to fight every monster, to stop every evil. Such work would have been impossible. Instead she led and inspired, bolstering the faith of countless humans, that faith in turn bolstering the wards and charms humanity used as protection from the predations of evil. There were occasions when Avacyn would fight, when some intractable or powerful evil would demand her personal attention. But there were always too many fights, too many prayers, for Avacyn to respond to every one. But occasionally a prayer would break through to Avacyn, a prayer imbued with such fervent faith or desperation that Avacyn felt a pull to help. Early in her existence there had been little conscious intent to this pull; she just knew she must intervene personally in certain events. But over the centuries she had gained more control over when and where she involved herself. The power of this mother's prayer, her shattering panic rising to a crescendo of need, reached Avacyn. The mother's fear for her child was pure and unalloyed, and such purity compelled direct action from Avacyn. Avacyn sped through the lower mountain valleys of Stensia, tracing an unerring path toward her petitioner, the strength of the woman's prayer a bright beacon in Avacyn's mind. The cloak covering the mountains changed from snow to trees, from the tyranny of endless white to the mélange of green, brown, and orange heralding the coming of the harvest moon. Avacyn was not prone to reflection, but she could not help feeling satisfaction at all that had been wrought since her release from the Helvault. The werewolves were gone, some cured and others transformed into the wolfir, helpful allies for Avacyn and her angels. The devils and demons were scattered and ineffective. And for the one of the few times since Avacyn's awakening, the vampires were in retreat. Humanity was free of its long siege of darkness, and civilization flourished. It was a new era for the humans. It was a new era for the world. And Avacyn would be there, continuing to protect the humans and protect the world, as she always had. Avacyn did not like smiling—she had never understood the point of it—but she suspected this is what humans felt when they smiled. A deep and abiding satisfaction. It felt...correct. Avacyn noted the wan light from the sun, soon to fall below the forested horizon. Night would rise shortly. As she alit upon a sparse meadow outside of a dark forest, she saw a woman lying on the grassy slope outside the first ring of trees, sobbing and crying out a name. "Maeli! Maeli!" The woman stood and walked toward the forest as Avacyn landed. "Petitioner. You have called me." Avacyn's tone was calm, reassuring, but the woman turned in a sudden terror before recognizing what she was seeing. "Avacyn! You came! You came! My child! Please!" The woman was frantic, and it took time for her to calm herself and tell Avacyn what had occurred. Her child had run away from home, and had been seen running off into the forest. While the world was much safer since Avacyn's return, it was still not a safe world. Especially for children. The mother had been about to brave the forest herself for her child, though she risked death for both of them. Avacyn assured the mother she would try to find the child. Such a matter would have been trivial if the child had been praying to Avacyn. But as Avacyn turned her focus to the hundreds of prayers currently whispering in her head, none of them were from a child lost in a forest. Still, there were other ways to find the child. 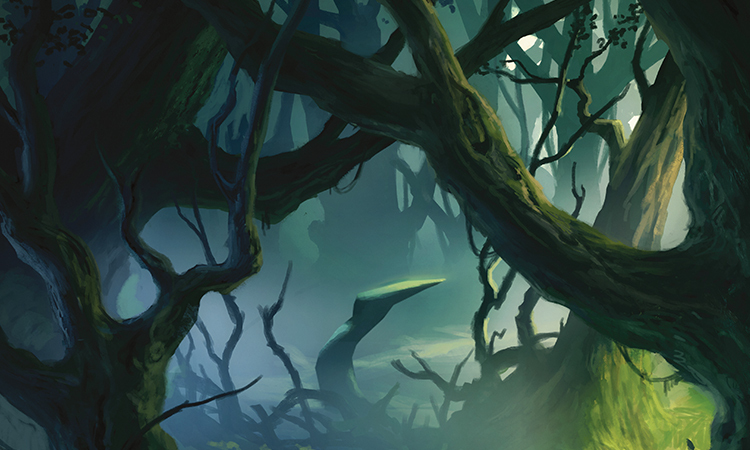 Avacyn flew over the dark forest until she approached its center. She channeled her power up through her spear, and its metal blade glowed bright. Brighter, brighter, until the light eclipsed the setting sun, and Avacyn channeled even more power, lighting up the whole sky above the forest. Avacyn could hear birds caw and animals skitter and even larger things thump below the forest canopy, all to get away from the bright light. Avacyn projected power into her voice. "Maeli! It is Avacyn! Call to me!" Her voice boomed and echoed off the trees throughout the forest. Then Avacyn was silent. She listened for a child's cry, and hoped for anything but silence and what that silence might herald. No voice reached out from the forest canopy, but a prayer did. Avacyn, please, I'm lost, and I'm sorry, and I'm wet, and I heard...Avacyn fixed the location of the child in her mind, and swooped over and down to a spot in the forest a few minutes away. It was a small child, a boy, and he was huddled in the crook of a tree. The boy looked at her, and at her glowing spear. "Avacyn?" "Child, come to me. You are safe now. I will get you home." Avacyn's voice was even softer now, the softest she could make it. Avacyn had always been most comfortable with children. Their innocence, their earnestness, made them easier to comprehend. The boy approached her, his hesitation overcome as Avacyn put her spear to one side and welcomed him with her other arm. He ran to her and she gathered him up in her arm and flew out of the forest. It took only moments for her to find the mother on the outskirts of the trees and give her the child. Both mother and child sobbed as they hugged each other. Avacyn wished every moment of every day was this. Families rejoined. Fear erased. Happiness created. This is why she was. Satisfied her work was done, she began her ascent back to her mountainous retreat. A violent shimmer wracked her body, shaking her vision. There was a soft buzzing in her ears. A constant low hum that neither raised nor lowered in volume. It was just...there, an off-tonal accompaniment to the prayers whispering in her head. The back of Avacyn's neck felt tight, and occasional involuntary shivers would shoot up from her neck through the rest of her head, as if in alarm to an attack. But no attack came. She shook her head in the hope it would clear the buzzing, but it remained in the back of her thoughts. The two humans still huddled in front of her, clutching each other, seemingly immune to whatever had struck Avacyn. As Avacyn watched, the mother's tears evaporated, her soft face hardened with anger. "How could you run away like that? What were you thinking? You stupid child!" She pushed the child away from her violently. The small human's face crumpled up in fear, and he started bawling. The seeds of men are rotten. Avacyn did not know where the thought came from. It was like a prayer, a missive sent directly to her head, though no mortal had uttered it. The seeds of men are rotten. Avacyn peered closely at the child, and where once she had seen innocence, she now saw other details. The poxed skin, the snotty nose, the scabs and crust of organic decay. The sniveling face in plaintive need of reassurance after committing wrong. Avacyn stumbled away, her balance off, her mind fuzzy. She took flight, weaving back and forth into the sky with an unusual lack of grace, leaving both humans below. She sought to hear prayers, but coating every word was the buzzing. She could not make out the prayers over the constant noise. Instead she came back to the same words again and again, plunged into her brain like a spear. The seeds of men are rotten. Avacyn fled, seeking refuge from her own mind. It was nowhere to be found. Macher paced the cloistered courtyard in the inner sanctum of the church, an acid unease gnawing his stomach. The courtyard was normally a place of serene comfort for him. A lush, beautiful garden where he could retreat away from the world's horrors and pain, especially in the cool dark night when no other priest walked its paths. But when the pain was inside the soul, no place offered succor. Macher stopped his pacing underneath Avacyn's silver symbol, mounted on a long iron pole at the center of the courtyard. Under the deep orange light of the late harvest moon, the pointed edges of Avacyn's silver symbol seemed poised to drip and splash into the mossy ground below, a neat moonlight illusion. Macher's mind returned often to the nature of illusions. Avacyn is real, isn't she? 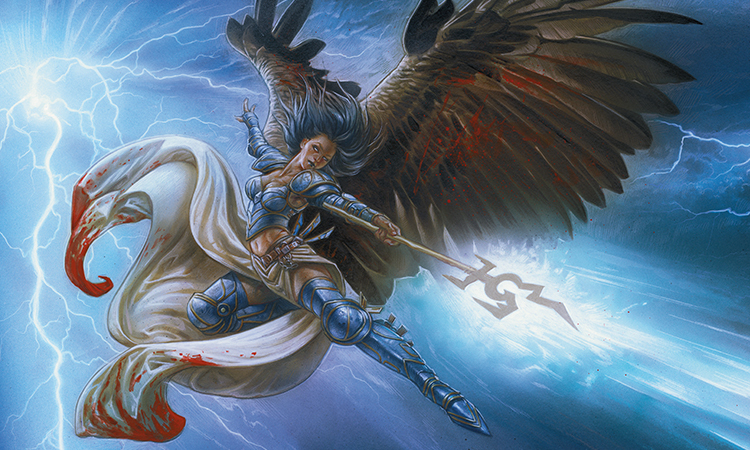 Macher had no doubt Avacyn existed, of course. He had seen her, had seen her angels. That Avacyn was real was not in dispute. But is she worthy of worship? Is she our god? Those thoughts he could not escape. He had been a true believer for most of his life, still just a toddler when his family had abandoned him at the door of the local parish, a fate of many a young child in this corner of Gavony. He had been fed by the church and clothed by the church and protected by the church, introduced to the doctrine of Avacyn before he could even read. The doubts had started last year, when Avacyn had mysteriously disappeared. It had been a grim time, the horrors of the world pressing upon Gavony and almost overrunning it. Macher had known Mikaeus, the former lunarch, and the night he had seen Mikaeus as a zombie had been the worst of his life. But then Avacyn had returned, and Gavony was now as safe as it had ever been. Safer. So why should doubt arise after triumph? 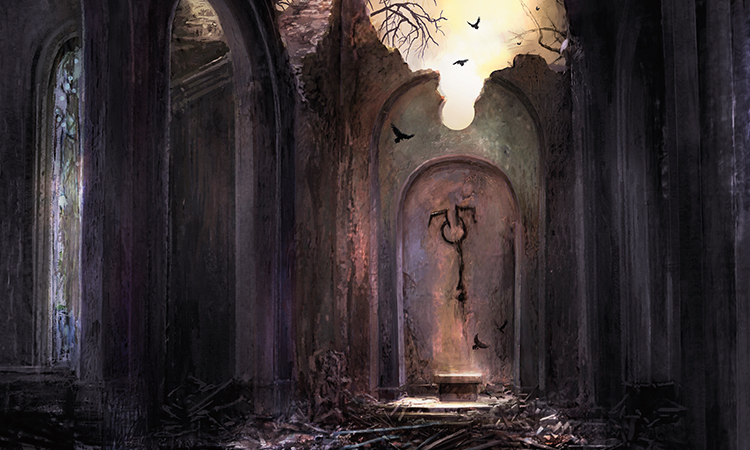 The rumors had run rampant through the clergy that Avacyn had been entrapped, imprisoned in the very Helvault in which so many creatures of darkness had been sealed away. The priests spoke of miracles, of Avacyn's power breaking her free from the prison, bringing a new era of light to the world. But how could a god ever be imprisoned in the first place? A prayer occurred to him unbidden, and he gave a rueful smile. Avacyn, please exist. Please be true. The full orange moon glowed in the crisp night air. Avacyn's symbol was completely framed by the moon, and the symbol seemingly shimmered and twisted under the orange light. Macher watched, transfixed, and lost himself in the moon's soft glow. There was a beating of wings behind him. Macher whirled, his mouth agape, and saw an angel descend. Striking white eyes rimmed with black, large lustrous wings, silver-white hair tinged with orange and red hues from the moonlight. A long moonsilver spear, glowing deep white with sparks of red at the tip, held in her hands. Avacyn. It was Avacyn herself, descending into the courtyard. "Do you hear the bees? Do you hear their cries?" Avacyn's words tumbled from her mouth in a rush, breaking the spell of her eyes. Her gaze darted frantically from one side of the courtyard to the other. Macher did not understand what she referred to, nor why she appeared anxious. "Avacyn, you came! You are here!" he blurted out. He was overcome with relief. He had prayed to Avacyn and now she was here before him. He felt ashamed at his doubt in his god. She is here to lead me back to the light, to truth. Avacyn's face changed. She stopped looking from side to side and focused on Macher instead. "You prayed for me to come." Her voice was cold, crisp, snapping him to attention. "You prayed to me. You prayed to me because you doubted." There was a scratch to her voice now, a pause before some words as if she was listening for something, or to something. She raised her spear. "There are other ways of ending your doubts." Her lips turned upward, trembling, an awkward mockery of a smile. Macher shivered in the darkness, looking past Avacyn at the moon and its bright orange light, wishing he were somewhere else. "Are you pure?" Her words flowed like honey. "I...what?" Macher did not understand. Many times he had envisioned meeting Avacyn. Never had he imagined an interaction like this. "Are. You. Pure?" Now each word clear and sharp as crystal. "Yes! I am pure!" Macher was relieved. His god was angry with him. She should be. He had doubted, but now his doubts were gone. "Pure in my..."
Her words overtook his, left them no room to be heard. "Of course you are not pure. How could you be? You were born." The scorn in her voice as she said the last word was unmistakable. She looked into his eyes, and he once more saw an inky blackness welling up, an endless blackness threatening to swallow him whole...he became dizzy, and almost stumbled to the ground, losing sight of her eyes, and the dizziness passed. He stood back up, careful not to look directly at her. You are not meant to gaze upon divinity. "Have you lost faith in me so easily, mortal?" Avacyn's lips quirked in a way that would have been a sneer on a human. Macher sputtered, unable to form coherent words in reply. She continued, ignoring him. "The more interesting question is..." she paused, and looked up at the dim night sky as if the moon were speaking to her, "...have I lost faith in you?" As she said the word "you," she looked directly at him. He wanted to scream, but no words would come. A wet stream flushed down his leg, puddling at his feet. Terror overtook him, and he crumpled to the mossy ground, clutching himself with eyes shut tight. Even through his fear and closed eyes, he could sense a luminescence drawing close. A chill shook his spine and he screamed. The scream subsided, and he heard a whispered "Soon," as a light, feathery touch brushed his face. A flapping of wings, and the luminescence vanished. It was a long time before he opened his eyes. He lay there huddled through the night, cloaked in terrifying certainty about the nature of his god. Liont woke up to the beautiful winter sun. Its faint light streamed onto his face, insisting upon his wakeful attention. Normally the shutters were closed to prevent such an early awakening, but he had forgotten to close them last night. One of the wooden shutters hung askew. I'll have to fix that later. He asked his wife how she slept last night, but she did not answer. She had stayed up late. It was unusual for him to be the first one up, far more common for Hilde to be caressing him awake or the children's squabbling voices to usher him into the morning. He came to his feet, shrugging off tattered and torn bed sheets. He had a full day's work ahead of him, and he wanted to start. His business was booming—never had his smithing been in more demand. He was at the forge or anvil for most of the day, and he was likely going to take a second apprentice soon. 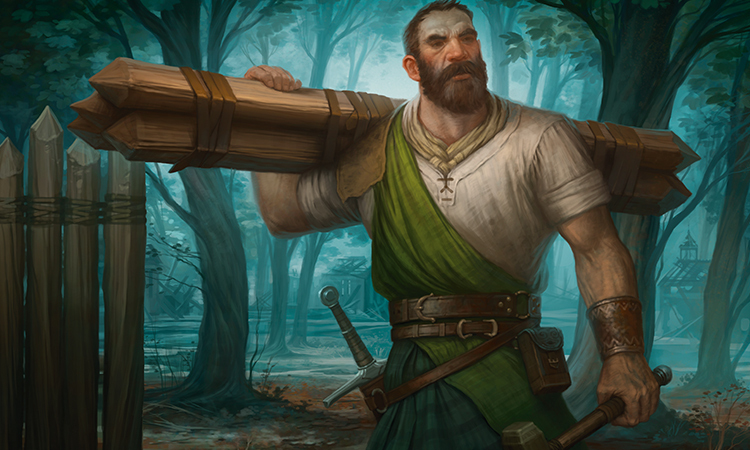 Ever since Avacyn's return last year, the demand for new tools and plows was high. And ever since the Cursemute, Liont was able to satisfy that demand. The Cursemute. 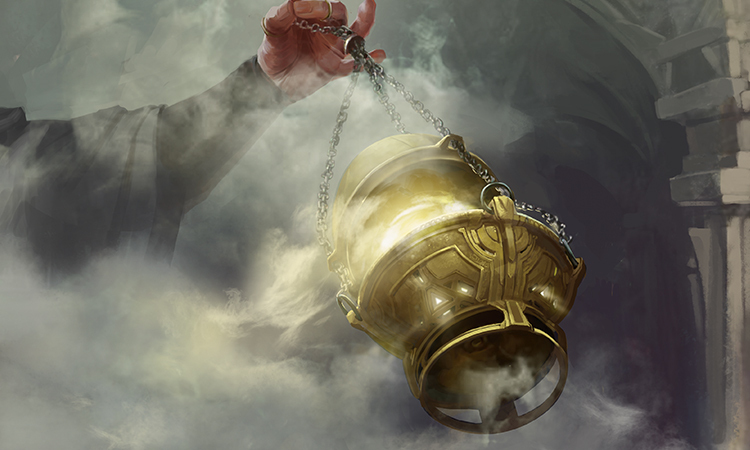 Everything had changed with the Cursemute, a blessing wrought by Avacyn's magic. Some werewolves had been transformed into wolven servants of Avacyn, the wolfir. But Liont had been cured entirely, and he said his blessings to Avacyn every day. He was back with his family, back in his home. Able to travel to the town, and look people in the eye, and know no fear. The absence of fear was wonderful, the absence of dread and worry and weight, no more constant gnawing clutching at his insides. No more staring up at the moon, wondering if night would bring the darkness, the true darkness. All dissipated into the light, thanks to Avacyn's benevolent power. He had a life again. A life with his family. He dressed, picking up scattered clothes from the floor. Some of these need mending. I'll give them to Hilde tonight. He went back to Hilde to wake her up. She was groggy, barely stirring, and her speech was still faint and wispy from sleep. "Good morning, husband." Hilde's mouth was still and small. Liont wanted to tell her a joke, to see her beautiful smile, but Hilde did not have the best sense of humor in the morning. "I'm going outside to the smithy, I need to get the plow started for Nickers. The children are still asleep." Hilde didn't reply. "Are you all right, dear?" He peered closer. Hilde's voice was still soft, faint. "The poxes are out in bloom." Liont was glad she was awake. "Good, darling, good. I'll be back at midday for lunch." Her voice was louder, colder. "Liont. When the door is knocked, do not open it." A shiver went down Liont's spine. When the door is...but he brushed the thought away. Hilde had already returned to sleep, lying motionless on the torn bed. She must have been up very late. He went to the bed of his children, stepping over shards of wood and glass, hearing them crunch beneath his feet. When Hilde wakes up she will not be happy with this mess. I will sweep it up later today. He stopped first at the prone form of Talia. She did not stir, her normally bright eyes, so joyful to see him, closed at rest. He shook her gently and her eyes opened. "Good morning, father." Her voice was listless, dull. She must be so tired. I will let her rest. "Go back to sleep, my daughter." He bent down and kissed her, his warm lips on her cool forehead. "Father. When the door is knocked, do not open it." Her words picked up strength. She sounded scared. When he rose up from kissing her forehead, she had already fallen back asleep. Liont realized he was scared, too, but put it aside. It was strange to feel fear on a bright winter morning, with the sun pouring through broken windows and large rents in the walls. It is cold in here. I'll have to board up those holes. He tarried briefly on the other side of the bed to say goodbye to his son. Kan was a few years younger than Talia, the perfect age to want to do all the things his older sister did, but do them in a way that infuriated her. Most days at this time he would already be running around the house, bouncing off the walls until his mother let him go outside to play in the fenced yard between the house and the smithy. But this morning he just lay quiet and still. As Liont stood there staring at his sleeping son, the boy's eyes flew open. "Father. When the door is knocked, do not open it." The boy's eyes were shut again, and Liont noticed how quiet the room was, silent except for the sound of a single person's heavy breath. Despite all the sunshine and chill wind whistling through the gaping rents in the walls, Liont felt stuffy, a pressure in his head that would not leave. Liont bowed his head under the aching pressure. The room was suffused with a coppery, bitter scent. He had to get out of the house. Three voices cried out in his bowed head, "When the door is knocked, do not open it!" There was another knock at door. A heavy thudding echoed throughout the room. When the door is knocked...Liont looked again at the open space where the door once stood. Something was wrong. Why was his house a shambles? I don't have time to clean this up right now. I have to get to the smithy. More knocking. Thud. Thud. Thud. How can there be knocking? There is no door. Pain blossomed in his head, pain so bright and fresh he sank to his knees with the force of it. As he closed his eyes tight he saw a bright door in his mind, a bright door pulsing with red. He heard more knocking, more heavy thudding, and it was coming from behind the red door, the door in his mind. He just had to open it, to stop the knocking. Everything would be all right if the knocking stopped. He reached out a hand in his mind to...do not open it. Liont grabbed the handle of the door inside his head. The handle was metal and ice cold. He pushed down on the handle, but it did not want to turn. He pushed, his hand hurting from the cold, and pushed again, growling. The handle turned. Liont opened the door. Suppressed reality burst forth into vision. He saw what was behind the door. No no no no no no...still on his knees, he rocked back and forth, clutching his head in grief and rage. Blood was everywhere. On the walls, the bed, the floor. His hands and body were covered in it, the blood leaking through the torn clothes he had put on minutes before. He looked at the body of Hilde, her face frozen in terror as she lay unmoving on the bed. Who had done this? He knew who had done this. Feverish images rose in his mind. The snarling, the screams, the claws raised high in the moonlight...he lifted his head and howled his agony into the cold winter sun, the sun that followed the hunter's moon. The Cursemute. What happened to the Cursemute? What he had done should not have been possible. He was free of the curse. Free! He snarled a prayer to the air, Avacyn! Why have you forsaken me! Avacyn! He knelt there sobbing for a long time. He wanted to die. He wanted his family back. He wanted to hear the laughter of Talia and Kan. He wanted to hear them fighting. He wanted it to be yesterday again. Please, let it be yesterday. Let me go to sleep and wake up in yesterday. I will wake up and I will leave. I will leave and never return. Just let it be yesterday, let...the roof of his house exploded overhead. Liont looked up, staring at the figure hovering above him, a figure with wings and silver hair and a large, glowing spear. Could it possibly be...? Could she possibly be able to...? His voice croaked with pain, the words barely able to form, "Please...please." The angel, perhaps it was Avacyn herself, did not respond, did not even seem to hear him speaking. She pointed her spear at him, and the tip grew bright, brighter, brighter than the sun overhead, and a lancing energy struck him in the chest, burning away clothes and skin. The angel pointed her spear at him again. Her lips turned up as she spoke the last words Liont ever heard. "Justice! There is no mercy." The spear flashed. Mercy, Liont thought, and then he died. A storm is coming, Sigarda thought. Lightning flashed in the dark gray sky, but no thunder ever came. It was unusual to see a storm in the middle of the cold winter, the season dominated by the hunter's moon. The air had hung heavy for days, the gray clouds unmoving, and now there was lightning without thunder, a storm without rain. Sigarda looked out over large swaths of the forest and was uneasy. She hovered in her personal solar, the bare stone walls and four thick buttresses in sharp contrast to the open vistas of dark green forests sprinkled with patches of white snow. 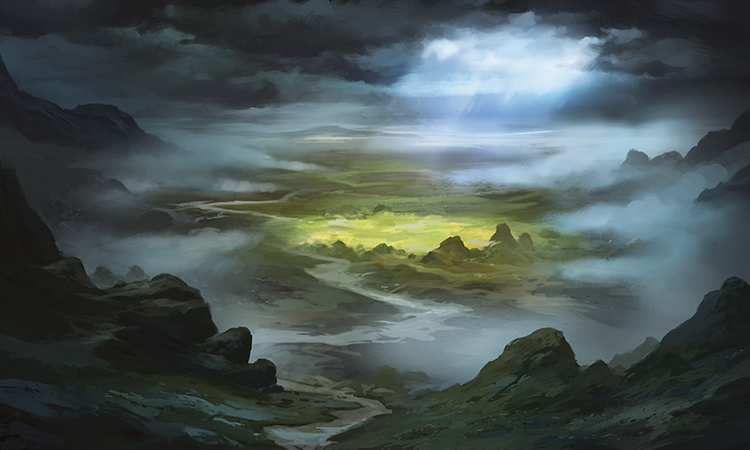 Sigarda could see for miles in every direction and often spent long stretches here when seeking quiet contemplation. The solar was at the top of a long-abandoned tower in a Kessig forest, a tower built centuries ago when humans had been more ambitious. They had become ambitious again. Avacyn's return last year had ushered in a new era of peace and tranquility. Humans had been spreading out across the land again, building new homes and farms and towns. But in the last several weeks, troubling reports had sprung up across the land. Uprisings and disappearances and slaughters. A shadow had risen over the world, and Sigarda wanted to know why. A lightning flash lit the dark sky, and another, and in between the flashes of lightning she felt her sisters' approach, and moments later they landed in her sanctuary. Slight Bruna, dressed in blue and white light armor with a flowing silk cloak trimmed in red lace. She wielded her staff, and its tip was already glowing with power, as if to strike down an enemy. Tall Gisela, cloaked in the red and white of her Goldnight flight, her twin blades already out of their sheaths. They are prepared for battle, Sigarda thought. She thought then of their other sister, the one who had died a thousand years ago, and she shivered. "Hello, my sister," Bruna said, an odd lilt in her voice. "You did not respond to our summons," Gisela said. Sigarda had not regarded it as a summons. An angel from the Goldnight had requested that she visit Gisela a week past, but Sigarda had been busy helping the communities of inner Kessig rebuild. "I was occupied with other duties, sister. I did not realize there was an urgent matter. How may I help?" Sigarda wondered if there had been an attack on the angels. It could explain why Bruna and Gisela seemed on edge. "It is no matter, now," Gisela said. "We are here," Bruna said. When the two angels had landed in her solar, they had stood very close together, almost shoulder to shoulder. But now they spread out in the room, each to a different side of her. And the way Bruna held her staff, and Gisela her two swords, made Sigarda keenly feel the lack of her scythe, resting in a room just downstairs. What is happening here? "We have just come..." Bruna began. "To talk. We have not seen you in a long while. Sister," Gisela finished. The two angels continued to move to her sides, each one on the edge of her peripheral vision. Sigarda could not believe her sisters would attack her, but the only rational explanation for their tactics was in preparation for an attack. Sigarda had never fought either of her two sisters, but she was confident she could handle Bruna as long as she could get to her scythe. Bruna was not especially skilled in direct combat. Her strengths lay in other areas. Gisela, on the other hand...Gisela would be a problem. More lightning crackled outside, and there was a loud burst of thunder. As the thunder subsided, Avacyn landed in the solar. Sigarda had not sensed Avacyn, not in the way she had her sisters' approach. She had never been able to sense Avacyn. Avacyn led them, but was not of them. As she had demonstrated so long ago. 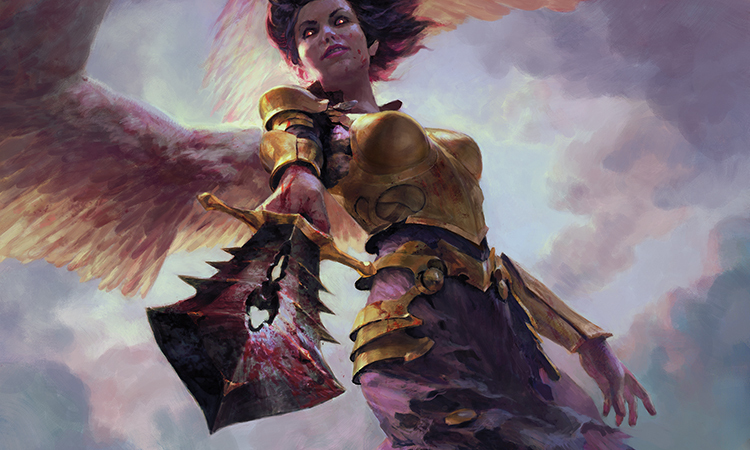 Sigarda could not deny the power of Avacyn, her ability to both fight the horrors of Innistrad and inspire the humans to continue their fight. But she still missed her sister. If Avacyn had come to fight, then Sigarda was dead. "Sigarda. The great work is soon to be underway." Avacyn's voice had a weird slur to it. Almost a slight hiss or buzz to her speech. At first, Avacyn had appeared as she always had, but Sigarda now noticed oddities. The metal points of Avacyn's spear were twisted. Even now the metal seemed to flow as Sigarda watched. She wondered what kind of power Avacyn was channeling through the spear. 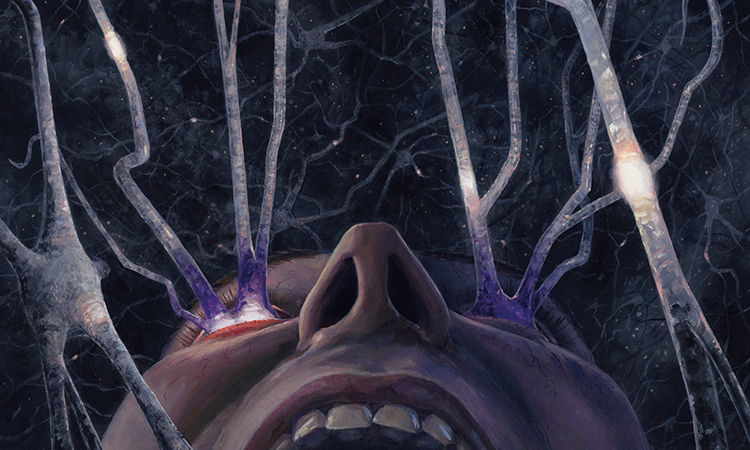 Even more disquieting were Avacyn's eyes. Normally pure white, there were odd flashes of black in her irises, a momentary opacity swallowing light. The three angels had a long and complicated relationship with Avacyn. Gisela, Bruna, and Sigarda weren't truly sisters, not in any way that the word described humans. But they had come from the same essence, the same dawn times, and they had fought the horrors of the world together for a very long time. Before Avacyn had first appeared, a thousand years ago, there had been four sisters, one the eldest and most powerful of the angels. Bruna. Gisela. Sigarda. And the one they would no longer name. They hadn't known what to make of Avacyn at first. She was an angel, one of them, and yet not. They could not sense her, the way they could other angels. She was cold, opaque, reserved. Sigarda knew many humans felt the same way about her and her ilk—there were many reasons it was difficult for angels to have close relationships with mortals. But among each other, there was usually the joy of shared purpose, of the connection that one angel can only experience with another of her kind. 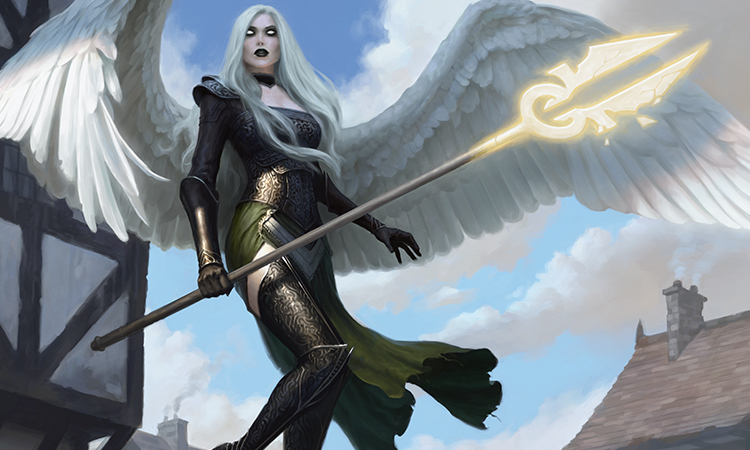 Avacyn shared no connection with the other angels. But her power was undeniable. Unstoppable, in fact. 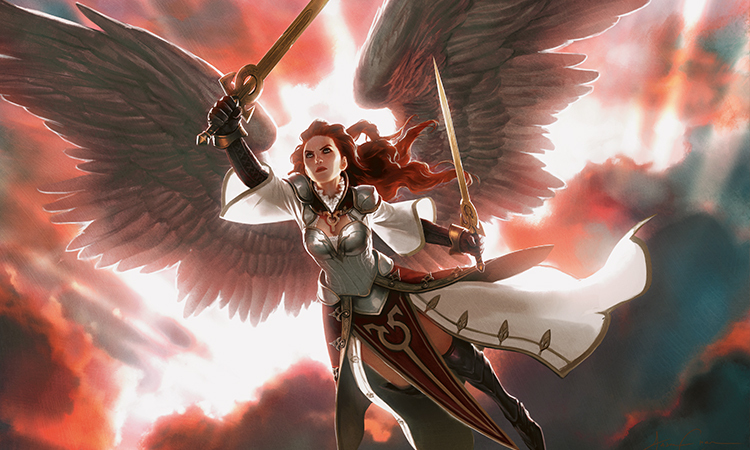 The sisters had never seen an angel with the power and confidence Avacyn possessed. And at each step in their early interactions, Avacyn's confidence had been intoxicating. She always seemed certain of each action she took, each plan she made. Humans were not the only creatures in need of a god to believe in. And then Avacyn had turned on their sister. It was true their wayward sister engaged in unconventional actions and made unwelcome allies. Sometimes she would consort with vampires and witches, even demons and devils. We must know our enemies if we are to defeat our enemies, she would say. She was often distrusted and disliked by the other angels, even sometimes by her three sisters. But the four of them had a deep bond, and though their sister charted a very different path, still she was their sister. Until the sister had formed an alliance with a demon lord, an act condemned by them all. 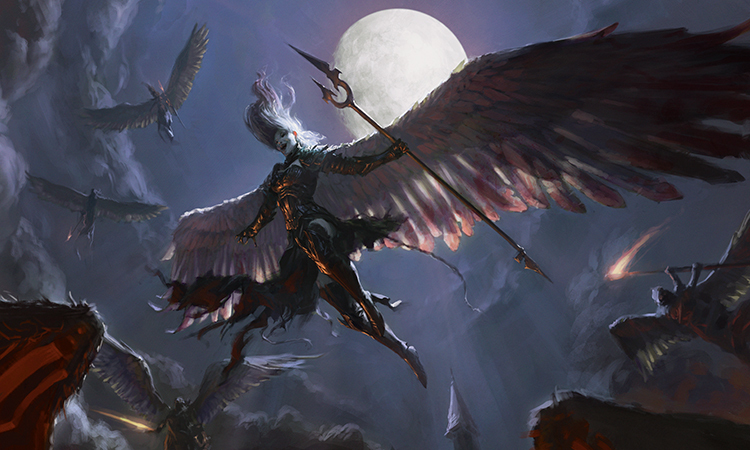 Avacyn had declared her a heretic, an accomplice to the very monsters Avacyn and all the angels were sworn to defeat. The three other sisters had agreed with Avacyn, but did not join Avacyn in her crusade against their dark sister. Avacyn had not needed their help. A thousand years ago, Avacyn single-handedly destroyed their sister and her entire small flight, and they had made the very mention of her name forbidden. And now perhaps Avacyn was here to end her. "The great work? I am unfamiliar with it. Enlighten me." Sigarda slowed her speech, her breathing. She fought best when calm. She could not see Gisela and Bruna at all, but she could feel them behind her. The air was stale and heavy, and a rotting smell emanated from somewhere, unable to be masked by the sharp, tangy odor of the approaching storm. "For so long the truth has been in front of us, but we have been blind, Sigarda," Avacyn said, her words almost slithering with that strange slur. "We fight monsters. The vampires, the werewolves, the zombies and witches and necromancers and devils. Why? Because they destroy. They pillage and consume. They commit violence against the land with the sole intent of sowing chaos." Avacyn paused, staring at Sigarda, her eyes once more flashing to black, and Sigarda felt the room was shrinking, closing in on her. "For their crimes we have sought to punish and kill. But the humans' crimes are the same." Avacyn smiled then, and Sigarda realized that in a thousand years of knowing Avacyn, she had never seen her smile. It was not a pretty smile. It was entirely disconnected from the rest of her face, her eyes. It was as though some involuntary reaction made the corners of her lips turn up without experiencing happiness or joy. Avacyn's voice rose as she continued, and her words became more punctuated, clear, the slurring fading. "They breed in their filth, creating new minions to destroy forests, pollute the water, lie and cheat and murder amongst themselves. What have they ever done that is worthy? What have they ever accomplished that is great? We could kill every single last supposed 'monster' of this world, every vampire and werewolf, and what would happen? Would there be peace? Would there be lasting light?" Avacyn saw the confusion on Sigarda's face, and the disgust. She laughed, a harsh laugh that almost cackled. "You know the answer, Sigarda. You know the truth." And Sigarda did know the truth. The humans were prone to awful acts, acts of intentional evil and unintentional neglect, and both were devastating. They did lie, and cheat, and murder. But they also did wonderful things. They loved and they built. They sacrificed and they served. They were free to commit good or evil, create order or sow chaos, and that freedom made every good act precious, a shining diamond glittering in the dark night. And besides, none of it mattered. Regardless whether Avacyn's argument was persuasive or interesting, betraying humans was not what angels did. It was as if Avacyn argued the sun should rise in the west, or the tides should no longer wax or wane. Sigarda did not respond. She did not see the point of a response. Avacyn was not interested in this being a conversation. In her silence, Avacyn continued. "I understand, Sigarda. These are hard truths, difficult. It took Bruna and Gisela some time to understand as well. But eventually they saw light." At the mention of their names, her two sisters spoke. "Now we believe..." said one. "Sister. The great work shall begin," said the other. When she couldn't see their faces, Sigarda realized she could no longer recognize which voice belonged to whom. "We will be back. Soon," Avacyn said. "We will need your help. The impure must be cleared, be punished. We will make way for true light. For ourselves and others like ourselves, who can create and maintain peace. Imagine it, Sigarda. No more violence, no more war, no more darkness." "Everlasting light," said a voice behind her, though she could not tell which angel said it. Or perhaps both said it at the same time. Avacyn held aloft her spear and pointed it at the stone roof. A surge of power leapt from the spear, and the roof...vanished. Obliterated by the force of Avacyn's power. Only a fine dust fell to the ground below, covering the angels in a sooty ash. "Soon," Avacyn said, and flew off into the dark gray skies. "Soon," Gisela and Bruna said from behind her, and did the same. Sigarda stood in her ruined solar, watching the lightning dance amongst the gray skies, though still no rain fell. Tears dropped from her eyes, splashing onto the dusty stone floor. She thought about her dark sister, a thousand years dead, and wondered why she hadn't fought for her, had not even tried. The storm is coming. 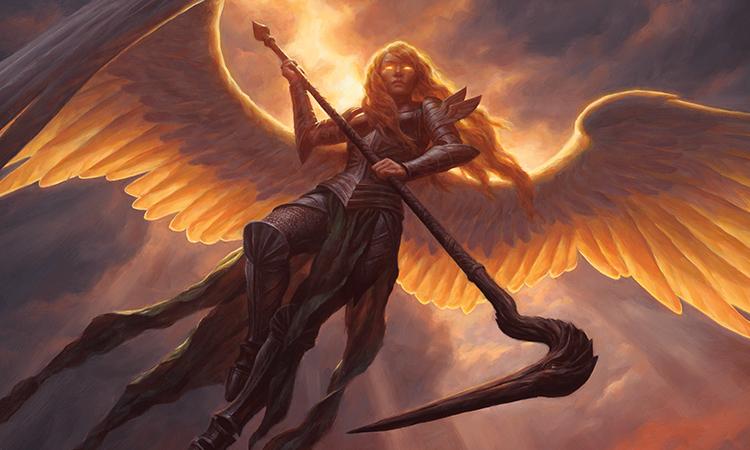 Sigarda considered the angels in her flight, wondering if any of them had gone over to Avacyn yet. She considered humans that could possibly help stand against Avacyn. There were few, so few. But Sigarda knew it didn't matter, even if no one joined her cause. The storm is here. This time I fight. "Maeli! Maeli!" Kelse's voice echoed through the growing dusk. Where is that child? Kelse peered under porches and looked through bushes. Most of the other villagers ignored her. He hasn't run away again, she told herself, hoping if she said it confidently enough it would be true. Kelse tried hard not to think of a few months ago, when he had run off. When Avacyn had appeared to save her child. Most of the village did not believe her. She and Maeli had never been accepted easily in the village, certainly not after Hanse had died. After his death, she was just the strange outsider from Kessig, with a wild child who took too much after his mother. And when she came back to the village that night, clutching her child and rambling about an appearance from Avacyn...well, she probably wouldn't have believed herself either. But Avacyn had come, had saved her child, her only child. Maeli had been born under the new moon, and had always been a special child, spirited and free. The villagers were right about Maeli taking after her. He looked like his father, a resemblance that caused Kelse both great joy and great pain, but in spirit he was like his mother, restless, yearning to explore. What she hadn't told the villagers that night was how mad she had been at Maeli. Of course she had been worried about him, frantic about him. Her panic at losing him had fueled her prayer to Avacyn, a prayer so powerful Avacyn had responded. When Avacyn had brought him back to her arms, all she had felt was relief, an overpowering joy that left her in happy tears. Until the change came over her. She could not describe it, could not explain it. In a moment all her love and care had left, vanished into the growing dark, and anger had filled her fully, a lightning bolt striking her heart. And not just anger, but a seething resentment and scorn, emotions she had never felt about Maeli before. And worse, she had displayed those feelings in front of Avacyn. Avacyn, who had saved Maeli. Who had saved her. But after Avacyn left them on that dark meadow, so had the anger. And it had never come back, and ultimately all Kelse cared about was that she had her child back, her wonderful joy. Now I just need to find him again. On poles at the outskirts of the village, torch flames flickered and sputtered in the cold winter wind, shadows lengthening as the dusk deepened. She bit her lip, wondering where she should look next, when she heard a loud cry behind her. She turned in a panic, but it was only Maeli, running toward her with a large grin on his face, shrieking happily, "Mommy, Mommy!" He ran into her arms and hugged her fiercely, and she hugged him back just as tight. You are everything I need in this world. Let the villagers scorn me, distrust me. I don't care. I have you. The torch lights suddenly all died, their flames extinguished. It was not the wind. The cold air had become utterly still. Maeli clutched Kelse close, and Kelse put her arms around her son. There was a scream from inside the village, then a flicker of light caught Kelse's eye from above and she looked skyward. Against the orange and purple of the darkening sky, the winged angels hovered high over the village. All of them wielded weapons, swords and spears and staves, and many of those weapons glowed with golden or silver light. The stars are descending from the heavens, Kelse thought. She looked down at Maeli, and he stared upward in open-mouthed wonder. Then one of the angels pointed her glowing spear downward at the village. A shaft of light fell from the spear onto one of the houses. The house was bathed in a bright light for seconds, and then the thatched roof burst into flame. The angel pointed her spear at another house, and there was another flash of light and another explosion. Other angels swooped down low, swinging their fiery swords, and shrieks and cries echoed into the night. Maeli screamed in her arms, his wonder transformed into terror. Kelse couldn't move, her muscles frozen, her legs rooted into the earth. There was a moment where she thought perhaps the angels were there to root out vampires or werewolves or some other evil. But from the outskirts of the village she saw neighbors die, either cut down by swords or consumed in golden light and flame. They are killing us. Maeli screamed again, breaking through her paralysis. "Maeli, my love, listen to me. You must run, run far and fast, deep into the woods, and do not come back. No matter what, do not look back, do not come back." Kelse heard her own words as if someone else was speaking them, and was amazed at how calm they sounded. More explosions and screams came from the village. Maeli sobbed, "Mama! I can't..."
"Maeli!" Kelse's voice was sharp and thunderous. "You will listen! Run! Run now, the fastest you have ever run! To the forest!" She broke free of Maeli's embrace and pushed him away. The boy looked at her for a second, tears in his eyes, before turning and dashing away, through the brambles and hedges that lined the village's edge. Kelse felt a sharp pain in her heart. Run, my child! Kelse looked up, and noticed the angel who had begun the destruction staring back at her from the sky. Looking at her and past her, toward the forest. No, you cannot have him! She began screaming at the angel, running in the direction below where the angel hovered. Avacyn, Kelse thought. Perhaps the angels had been possessed by evil spirits, or they were some malevolent force in disguise. But whatever was happening, Avacyn would save them. Standing just below the angel, Kelse bowed her head. Avacyn, hear my prayer. Help me now, help us now. Please, my Avacyn, you saved my boy once, please save him again. Save us all. "You do not need to pray your lies to me, creature. I'm right here in front of you." Kelse heard the voice just above her. She looked up, and saw an angel dressed in black, her wings steeped in blood red, her eyes dark and pitiless, nothing like the loving eyes she had seen just a few months back. The voice was familiar and strange together, with some type of accent marring her words. It was Avacyn. Avacyn was here. Avacyn was destroying her village. None of this makes sense. For a moment Kelse thought perhaps she was dreaming. 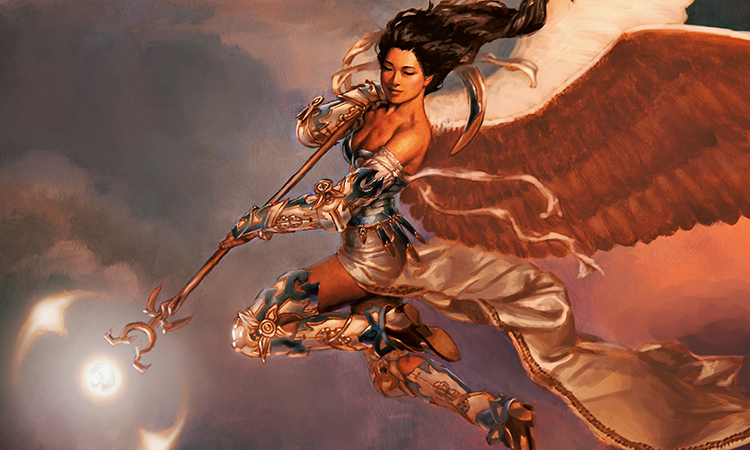 She noticed Avacyn's spear, the long uneven blades attached to a symbol of Avacyn glowing bright and beautiful. But the symbol was all wrong, twisted and warped, as if the metal had somehow gone sour. That is not possible. Metal cannot twist like that. This is all a bad dream. But she knew this was real. The angels had turned on them. The angels were killing them. "Why have you forsaken us?" Kelse cried out. She didn't know whether she spoke to Avacyn or to the uncaring night sky, but neither responded. Throughout the village, screams rose and ceased abruptly as the angels continued their attacks with blade and fire. The flames rose higher behind Kelse, consuming her village, consuming all the trappings of her life. 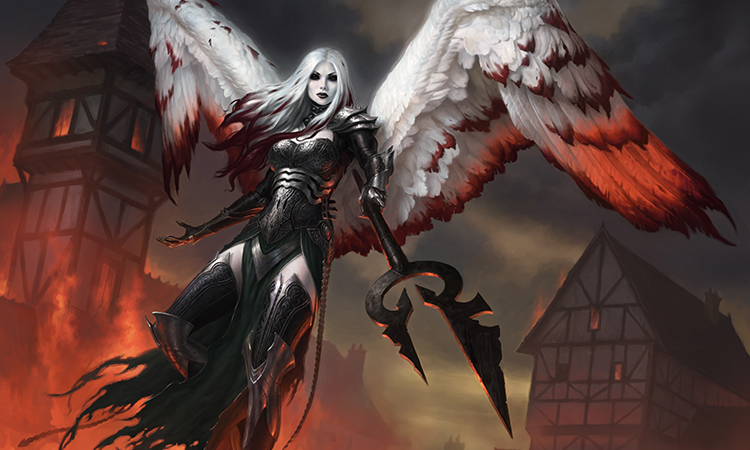 Avacyn descended softly, her red-soaked wings still, her eyes black and lidded. "The great work begins! Fitting you should be here to witness its glory." Avacyn paused, looking past Kelse. "Where is the small creature? It should be here, too." "He's gone! Beyond your reach, foul thing." Kelse was sobbing, struggling to breathe amongst the smoke and grief. Run, Maeli, run. There must be somewhere safe. Find it, my love, find it! "Beyond my reach?" Avacyn landed a foot away from Kelse. Kelse heard a loud buzzing noise coming from somewhere, and she covered her ears in pain. Avacyn reached out and touched Kelse on the cheek, stroking her trembling flesh. "Everything that is, is within my reach. My domain has no limits. And my domain has rotted. Putrefied. Everything must be cleansed. Everything must be pure." Avacyn stopped, withdrew her hand. "It is no matter. I will find the small creature eventually. I will find all of you, eventually." She took a step backward and pointed her spear at Kelse. "All will burn. All will bleed." The tip of the spear sparked with red and gold light. Avacyn watched as the remains of the mortal creature blew away, the ashes scattering and swirling for a moment of flight before falling to the ground. Chaos into order. Corruption into purity. Peace increases. The sky whispered to her. The rivers, the trees, the grass, the moon. All whispered glorious truth. For so long I have listened to the whispers of liars, and the world has suffered. Now she was listening to truth. She knew it was truth because every whisper said the same thing, so unlike the chaotic, conflicting prayers she had heard for hundreds of years. Why did I not realize how inconsistent these mortal creatures are? Their words always change. No matter, now. Now she understood. She looked at the moon, and the moon whispered such beautiful words. All will burn. All will bleed. Avacyn repeated the words to herself, a soothing song filling her head with joy. All will burn. All will bleed. She laughed and smiled as her angels continued the great work in the burning village.